Sideroxylon inerme, a tree with a rich history, is a must for coastal gardens with its dense foliage, black berries and small, dainty white flowers. 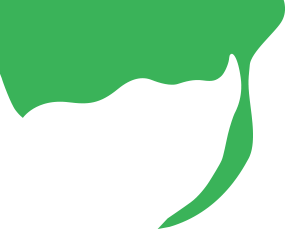 A small to medium evergreen tree, which grows to a height of 10-15 m. The tree has a sturdy trunk that is normally 600mm in diameter, and a large, dense, rounded crown. The bark is normally grey-brown to black. Young branches are always covered with fine hairs. The leaves are leathery and spirally arranged, dark green above and dull beneath. Fine hairs are also found on young leaves. The tree has small greenish white flowers with a strong, unpleasant smell. It flowers during summer and autumn (November to April). 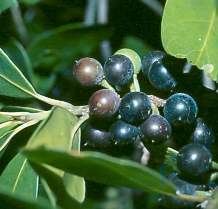 Fruits are purplish black, small, round and fleshy and like the leaves, contain milky latex, and are present from late summer to spring (February to September). Sideroxylon inerme is widespread on mountains and is not an endangered species. It is, however, one of South Africa's Protected Trees, which means that no milkwood may be damaged, moved or felled. This species is commonly found in dune forests, almost always in coastal woodlands and also in littoral forests (forests along the sea shore). It also occurs further inland in Zimbabwe and Gauteng. 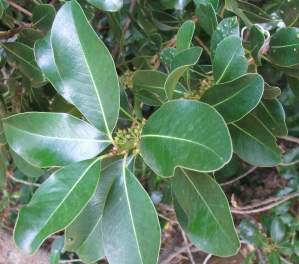 Sideroxylon is a small genus found in Africa, America and Asia with one species in South Africa, Sideroxylon inerme. The genus name is derived from the Greek sideros meaning iron, and xulon meaning wood, referring to the hard wood. Sideroxylon inerme is a protected species in South Africa. Three specimens have been proclaimed National Monuments. One of these is situated in Mossel Bay and is called the 'Post Office Tree'. Portuguese soldiers in 1500 tied a shoe containing a letter on the tree, describing the drowning at sea of the famous Bartholomew Dias. This tree is said to be 600 years old. Another renowned specimen is the 'Treaty Tree' in Woodstock, Cape Town . Next to this tree stood a small house where the commander of local defences handed over the Cape to the British in 1806. 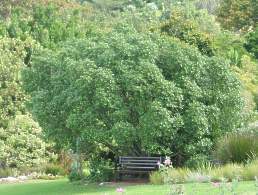 The third National Monument is a tree called 'Fingo Milkwood Tree' near Peddie in the Eastern Cape. The Fingo people affirmed their loyalty to God and the British king under the tree after English soldiers led them to safety when Chief Hintza and his warriors pursued them. Speckled mousebirds eat flowers. Birds, bats, monkeys and bush pigs eat the fruit. Bark and roots have medicinal value and are used to cure broken bones, to treat fevers, to dispel bad dreams, and to treat gall sickness in stock. The wood of the tree is said to very hard and fine-grained and is used as timber for building boats, bridges and mills. Ripe purple-black berries are said to be edible, with purple, juicy flesh and sticky white juice. These trees can be grown from cuttings but only semi-matured side shoots should be used. Cuttings however should be placed in a mist unit with bottom heating. Cuttings should root within 6 to 8 weeks and after rooting should be hardened off for two weeks. The cuttings should then be potted up in a well-drained soil mix. Results have shown that seed sowing is the best method of propagation. Collect the fruits and remove the flesh before sowing the seeds. Sow seed in a sandy, loam soil mix in a seed tray. Keep the tray moist in a warm place that will enhance better germination. Seeds should take 4 to 6 weeks to germinate. Sow seed in summer. Sideroxylon inerme is a semi-coastal tree but direct sea wind can result in considerable burn damage from salt-laden wind, so it should be planted where a windbreak offers it some protection from the sea wind. A special feature of this tree is that it makes an excellent firebreak. In the Veld & Flora of June 2006, Andrea Durrheim describes in a letter to the Editor how a row of milkwood trees stopped a fire dead in its tracks behind her cottage. People with beach or holiday houses situated on mountains where fires frequently occur, should consider planting a row of milkwoods as a firebreak. Pooley, E. 1993. The complete field g uide to trees of Natal, Zululand and Transkei. Natal Flora Publications Trust, Durban. Van Wyk, P. & Van Wyk, B. 1997. Field guide to the trees of southern Africa. Struik, Cape Town. Goldblatt, P. & Manning, P. 2000. Cape plants. A conspectus of the Cape flora of South Africa. National Botanical Institute, Cape Town & Missouri Botanical Garden. Kesting, D. 2001. Wild flowers of the Cape Peninsula. Botanical names. Derivation and meaning. 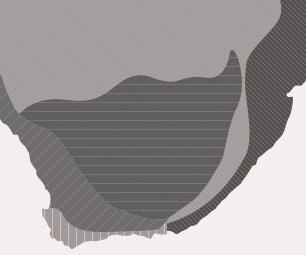 Flora Documentation Programme, Cape Town. Smith , C.A. 1966. Common names of South African plants. Memoirs of the Botanical Survey of South Africa No. 35. Fox, E.W. & Norwood Young, M.E. 1982. Food from the veld. Edible wild plants of southern Africa . Delta Books, Johannesburg.